You asked for them, now they’re here. I’m so happy you’re treating yourself to online Pilates classes! I’m Lesley Logan, and I’ve been teaching Pilates around the world for 11 years now. After completing my 600-hour mat training and two higher level masters programs (one with a man who studied directly with Joseph Pilates himself) I wanted to build something that you could take with you wherever you go, so I started offering these online classes. Whether you’re in the studio, at home or in your hotel room, I know you’ll love them. After introducing the online mat Pilates classes, everybody kept asking me to offer reformer classes – and so here they are! WHAT DOES CLASS LOOK LIKE? Below are two 5 minute sample clips of an online reformer class and an online mat class. Every week there will be one Mat and one Reformer class for you to take. You can take class as many times as you want, at any time and any place! Classes are live for 7 days and then they disappear. So much more convenient and less than half the price of going to the gym or studio. Get the combined Mat and Reformer class package and save even more! Tablet? Phone? Desktop? No problem. You can easily login and take class on any device at a time that fits your schedule. Spending 15 minutes deciding what class to take? Here there’s only one live mat and one live reformer class each week. But, don’t miss them or they’re gone! Sneaking in your workout between clients? Or maybe at the office? Classes are the perfect length at 30+ minutes. Long enough to get you sweating without taking over your day. Enjoy! So often I hear that there is too much time between the exercise transitions with lengthy explanations, when all you really want to do is work out. Well, we FLOW here. Join this membership to access Lesley Logan’s weekly online Pilates MAT classes. This membership automatically bills weekly so you don’t have to go through the checkout process every time. You can cancel your subscription or sign back up at any time from your account dashboard. 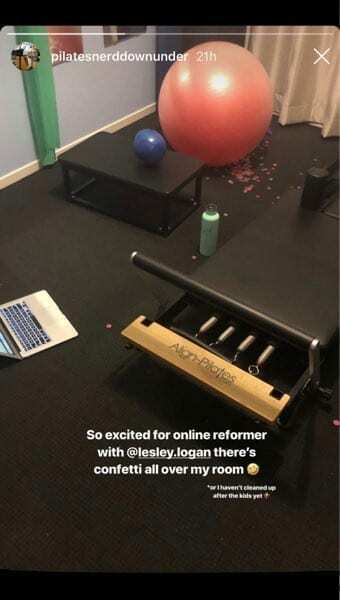 Join this membership to access Lesley Logan’s weekly online Pilates MAT and REFORMER classes. 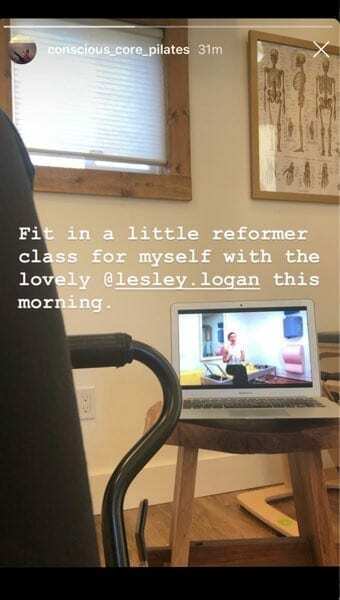 Hello Lesley, I would sign up for your weekly online reformer class in a heartbeat! I love the reformer! Whenever I hop on it feels like coming ‘home”. In addition to my weekly privates I do an intermediate classical reformer session on my own once (and if I’m lucky twice) each week. I average about 45 minus when I do the entire intermediate repertoire (with rowing) thrown in. So a class that’s between 30-45 minutes sounds perfect to me. Your 30 minute mat classes are a dream. I love the format of your mat classes, following the classical order but with different emphases and focus each week. There’s always enough variety to keep class interesting but I feel I am really learning something new each week while also gaining mastery of the classical exercises and my body. I also really appreciate when you break down some of the more complicated or challenging exercises and offer modifications, preparations and substitutions. So I would love to see that in the reformer class as well. I would also like to learn how to prepare myself to learn more advanced exercises, as I hope to one day be ready for snake and twist and control balance. 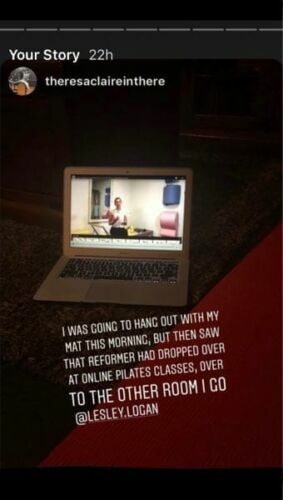 Hope that’s helpful and I really look forward to your online Reformer Class. I consider your weekly mat class an integral part of my home Pilates practice and I can feel the ways I have grown stronger and more confident on and off the mat since I began doing your class. Plus it’s just downright fun! Not sure if you're ready for class? 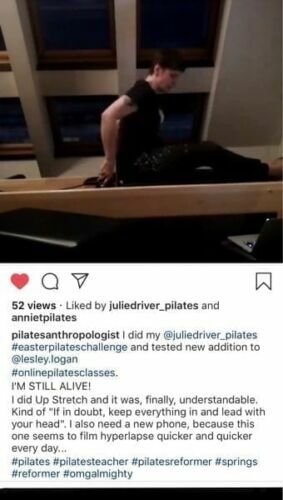 OnlinePilatesClasses.com brought you the first free online catalogue of Pilates exercise video tutorials, where Lesley breaks down individual exercises in 3 to 5 minute videos. Copyright © 2019 Lesley Logan Pilates, Inc.